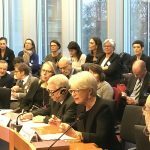 The first EBA European Parliament round table event took place on 22nd of January 2019. The event was hosted by Ms. Grossetête, of the EPP party (European’s people party, Christian centrum-right) and Mr. Balas of the Socialists & Democrats and moderated by EBA’s Executive Director Catherine Hartmann. 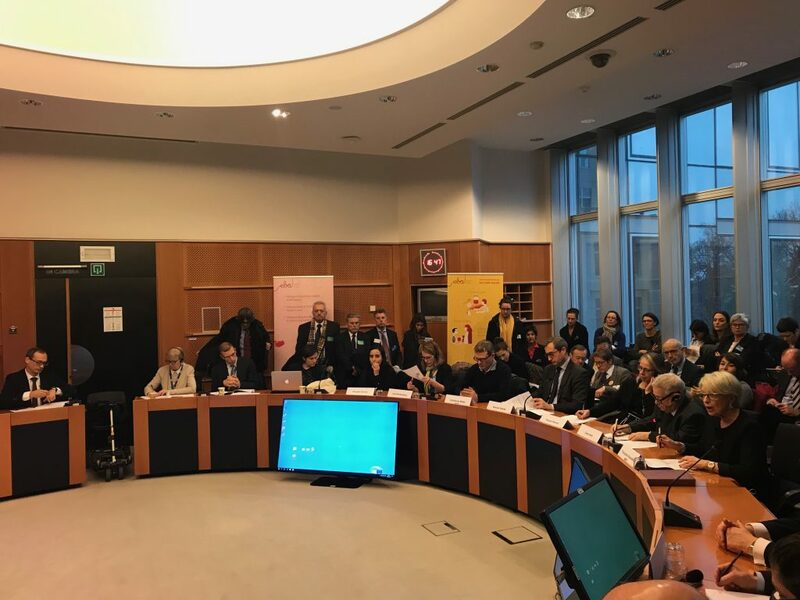 The meeting was organised to raise awareness on the challenges of a sustainable blood supply in Europe and was aimed at EU health stakeholders, Members of European Parliament (MEP), European Commission representatives and Member States health attachés. More than 90 people attended the meeting. This number was larger than expected, demonstrating a strong interest in the subject matter, probably due in part to a desire to continue the reflection on the Blood Directives, after the European Commission concluded its consultation in 2018. A Commission report was expected at the end of December or beginning of January, but will now be released in the spring 2019. The EBA debate also served as a platform of discussion, to maintain the momentum after the EC evaluation of the Blood Directives. MEP Grossetête (pictured left) opened the meeting noting the importance of voluntary non-remunerated donation (VNRD – for all body parts), underlining the need to maintain solidarity among citizens. She recalled the European Parliament debates from the end of the 1990s when the first Blood Directives were adopted and explained that winning on the principle of VNRD was already difficult at the time and should not be challenged for the potential upcoming revision of the texts. The first session dealt with the question on whether blood is a “good”. MEP Guillaume Balas, lawyer Samuel Valcke and Professor Tamara Hervey explained how conflicting European directives and articles, in particular on Medicinal products legislation led to putting the subject into the hands of the European Court of Justice. The legal options were explained to the round-table audience. In the second session on rare blood groups and how to secure a robust donor base for that, speakers Lisa Klinkenberg and Khadija Kerissi emphasized the need for donors of all heritages, to make up a good donor base that would be able to cater to the needs of the multicultural population. They presented techniques to attract new donors to match the needs and retain them, based on research they had led. They were followed by Georgios Kakou Constantinou, a thalassemia patient who presented his own story of a person who needs regular blood transfusion. A great testimony of what being chronically ill with a rare disease means, Mr Constantinou helped understand the importance of a constant and safe supply of red blood cells, which he needs to keep him alive. The last session was on Voluntary Unpaid Donations. Alice Simonetti, from FIODs praised the solidarity aspects of the lifesaving gift of the voluntary, anonymous and non-remunerated donors. Cees Smit, a lifelong plasma products user, noted that thanks to medical progress, haemophilia patients now have a life expectancy similar of that of non-patients. He urged governments to increase domestic plasma collections as Europe is now dependent on US paid plasma and he reminded how that in the past has led to unfortunate transfusion transmitted infections. Philippe Vandekerckhove closed the meeting emphasizing the importance of donors for the whole supply chain of blood and blood products. The donors, he noted, are the least elastic economic part of that chain, as they cannot be “turned on and off” as readily. Therefore, it is important he noted, not to scale up or down collections at the spur of the moment, but with solid planning and policy for blood supply and with the support of the donors. The meeting was very successful and the feedback positive. EBA will consider a follow-up meeting to further the conversation and share knowledge with EU stakeholders probably later this year. It could take place after the European elections this spring and Brexit and on the occasion of the publication of the “European Commission Staff document” on the Blood directives, maybe in the second half of the year. Session 1 – is blood a good?